Were you injured in a car accident because your brakes failed due to manufacturer defect? Did you contract food poisoning from contaminated food? Is your child experiencing developmental delays due to a pharmaceutical drug you were prescribed during your pregnancy? Have you suffered an injury while using a defective tool? These are just a few examples of the many incidents that can lead to a product liability claim under New Jersey Product Liability Law. 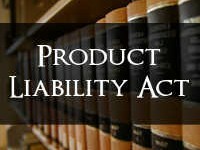 The New Jersey Product Liability Act, passed in 1987, governs most product liability claims in the state. Environmental tort actions and breach of express warranty claims are excluded. In most cases, this law reflects conventional concepts of strict liability. This basically means that you don’t have to prove that the responsible party was negligent. The law establishes a duty by manufacturers, retailers and various other parties in this chain, to the consumers who use their products. It makes them responsible for ensuring that their products are reasonably safe, proper and fitting for both the product’s intended use and uses that should be conceivable or foreseeable. This duty also extends to other people who may be expected to come into contact with the product. Therefore, if you can prove that these parties did not fulfill their duty, that is enough – they are liable. The word “reasonably” is a big deal with these claims. Essentially, the makers and sellers of a product cannot be held legally liable when harm comes to someone who acts in a manner that is unreasonable. The courts will typically look at the general populace and how a “reasonable” person thinks and acts in a similar situation. Design Defect – The product was manufactured according to its intended design. The materials used were of good quality. But when the consumer used it as intended, it caused harm or injury. A power saw that is designed without a guard may seriously injure a person, even when using the tool properly. Inadequate Instructions or Warnings – The responsible parties must warn consumers of any potential dangers associated with the use of their product, unless the dangers are obvious. A knife cuts. A lighter burns. If you cut or burn yourself, this does not amount to a product liability claim. Likewise, don’t use a knife as a razor. Manufacturing Defect – The manufacturer made a mistake during the process of building the product. The end product deviated from the intended design in some way, and this error caused harm or injury to the end user. A chair may be designed safely, but when manufactured, a leg was bolted incorrectly resulting in injury. As with most laws, there are many different interpretations and a number of ways that both parties can argue the law in court. It’s not possible to cover this complex law in a single article. When you have been injured by a defective product, a skilled and experienced New Jersey Products Liability Lawyer is essential in building your case and litigating on your behalf.